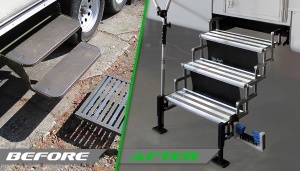 GlowStep Revolution is the only step for RV Towables that offer 7" of Vertical Adjustment at the top and bottom of the step. 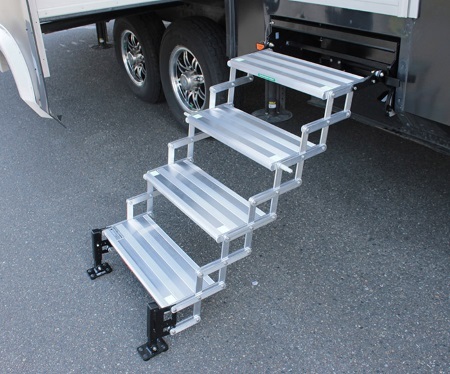 Step Size is 6" x 20"
3 Step, Mounting Bracket Height 27"
4 Step, Mounting Bracket Height 34 1/2"
5 Step, Mounting Bracket Height 42"
6 Step, Mounting Bracket Height 49 1/2"
Step Size is 8" x 20"
2 Step, Mounting Bracket Height 19 1/2"
It connects the step with the ground (Earth to RV) eliminating the unstable and unsafe diving board feeling associated with factory steps. 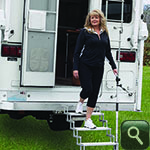 When used as a handrail the GlowGuide system is designed to dramatically enhance the safety of your RV step entry/exit system and is available in two different configurations: the A7600 for truck camper scissor step systems and the A7610 for all other RV step applications including electric steps. 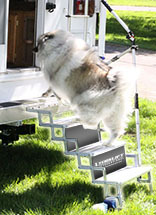 The upper door mount GlowGuide arm will run up to the door entryway, the lower step mount arm will run down and attach to the step system, the strut arm will run diagonally and attach either to the bumper or the back of the RV (truck camper applications) or to the side of the RV/Trailer. Due to all three arms being telescopically adjustable, the mounting location at the doorway for the upper arm and the mounting location for the strut arm as well as the step mount are not specifically set and can be mounted within a range to best suite each particular installation application. 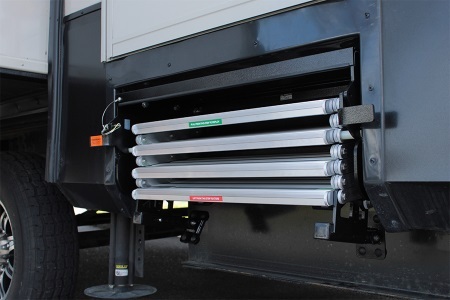 A lock system to secure the GlowGuide to the outside of the RV is available and sold below. 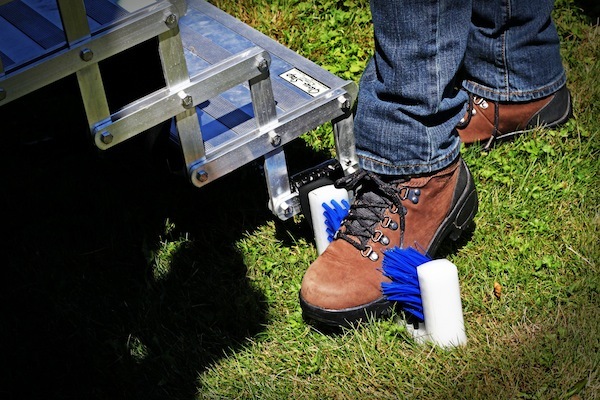 The DirtDestroyer is a specially designed cleaning attachment that works with any scissor step including the GlowStep. 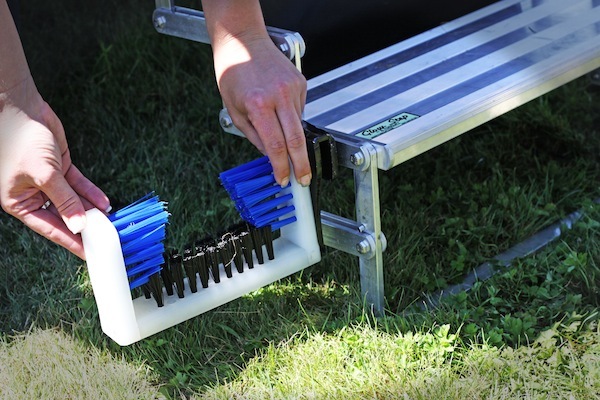 It allows you to leave the dirt outside your RV and keep your interior clean for the duration of your camping vacation.